Read the Frank Kameny Tribute delivered at the National LGBT 50th Ceremony. 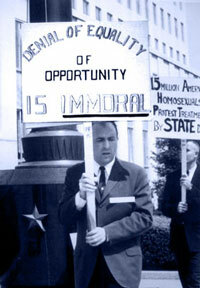 FRANK KAMENY was the chief strategist and the father of the LGBT civil rights movement. The nonviolence of black civil rights organizers Bayard Rustin and the Rev. Dr. Martin Luther King Jr. influenced his methods. Kameny’s termination fueled a lifetime of activism. He fought his dismissal in the federal courts and in 1961 filed the first gay rights appeal to the U.S. Supreme Court. The same year, Kameny cofounded the Mattachine Society of Washington, D.C., with Jack Nichols. The Mattachine Societies of New York and Washington became the first gay civil liberties organizations in the United States. Later, Kameny helped start organizations that would become the National LGBTQ Task Force and the Human Rights Campaign. Kameny appeared in “Gay Pioneers,” a documentary co-produced by WHYY/PBS and Equality Forum about the Annual Reminders. In 2007 the Washington City Council honored him as a “true freedom fighter,” and in 2009 he received a formal apology for his dismissal from the Army Map Service. 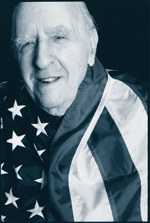 Frank Kameny was celebrated during LGBT History Month in 2014. For more information, visit lgbthistorymonth.com/frank-kameny.